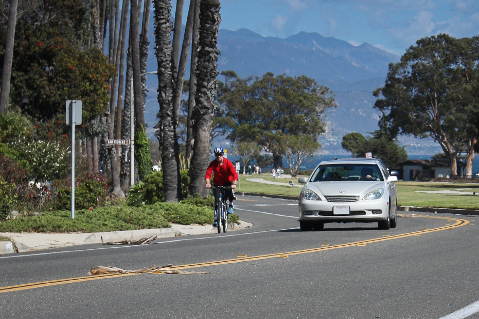 A cyclist and motorist move safely along Santa Barbara's Shoreline Drive. In December 2013, a Los Angeles driver accidentally struck and killed a man. Sheriff’s Deputy Andrew Wood’s squad car hit former Napster executive and entertainment attorney, Milt Olin, as he pedaled down the bike lane on Mulholland Drive. Though the details suggest a dangerously distracted driver, no charges have been filed against Wood. Many believe this case illustrates a tolerance for negligent driving and a general lack of concern for the safety of cyclists. Witnesses reported that Wood’s squad car failed to turn as the road curved. The car entered the bike lane at full speed, braking only after colliding with Olin, who was pronounced dead at the scene. The records show that the officer was using his mobile computer (called an MDC) at the time of the incident, as well as texting with his wife on his personal cell phone shortly before the crash. The L.A. County District Attorney’s analysis states, “Wood entered the bicycle lane as a result of inattention caused by typing into his MDC.” Despite the driver’s inattention to the road, the DA decided not to press criminal charges against Wood, citing the use of the MDC as part of his job and indicating that his personal cell phone was only in use while Wood was stopped at traffic lights. Law officers carry a tremendous burden, dealing with difficult hours, physically and emotionally demanding work, and the responsibility for protecting people who are resentful of their mere presence. In cases where misconduct is suspected, judgment should be withheld until all information is considered. However, failing to prosecute in cases where there has been clear and criminal negligence is a disservice to the thousands and thousands of upstanding, courageous and dedicated officers. Critics of the DA’s decision have alleged that the officer is receiving preferential treatment on the basis of his position in law enforcement. However, the lack of prosecution may have more to do with our society’s feelings about transportation and beliefs about technology. In many countries, cycling is viewed as a major means of transportation. Infrastructure and laws reflect this belief. 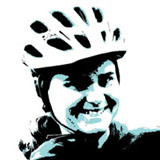 In the U.S., biking is often viewed as both recreational and reckless. When a cyclist is involved in a collision at dawn or dusk, the immediate response is to ask why he was riding in the first place. We don’t question drivers who dare to make their way to work or the grocery store in the rain, at night, or in heavy traffic, despite the increased risk, because we view driving as both normal and necessary. Many motorists view cyclists as a nuisance and an impediment to their own free travel. Traffic psychologist Ian Walker says cyclists are “engaging in an activity that is deemed slightly inappropriate in a culture that views driving as normative and desirable and, arguably, views cycling as anti-conventional and possibly even infantile.” In a nation culturally inundated with car travel, it may be easier to identify with a man who accidentally ran over a cyclist than with someone who went out biking and lost his life. Transportation is inherently dangerous. There can be increased risk where cars and bikes interact; however, the greater threat is posed by the automobile. Bicyclists and pedestrians are much more susceptible to harm than motorists. Pedestrians make up only 10.9 percent of trips, yet they represent 14 percent of fatalities, and cyclists represent only one percent of all trips, but 2 percent of all fatalities. Inattention to others on the road is frequently the result of our obsession with mobile technology. Drivers often take their hands off the wheel and eyes off the road as a result of their cell phones. Despite evidence that texting while driving is even more dangerous than drunk driving, people continue to do it. According to the CDC, nearly 70 percent of 18- to 64-year-olds surveyed admitted to talking on the phone while driving, and 31 percent had read or sent text messages while behind the wheel. In 2010, 18 percent of collisions resulting in injuries or death involved distracted driving. We have all experienced brief moments of distracted driving whether due to crying children, a malfunctioning GPS, a loud radio, or a buzzing cell phone. The reality we must live with is that a single poor decision on the road, an instant of careless inattention, can result in death. Since learning of the tragic and preventable loss of Milt Olin, I feel a renewed sense of responsibility as a driver. Each time I get behind the wheel, I vow to stay as present and attentive as possible while driving, and every time I get on my bike I hope the drivers around me do the same.